TN Twisted Nematic. A type of liquid crystal whereas the alignment surface and therefore the LC molecules are oriented 90' from each surface of glass. Produces images in two modes: Positive and Negative. Positive Mode provides white background with black segments. Negative Mode provides black background and white segments. When two polarizing filters are arranged along perpendicular axes, as in the first illustration, light passes through the lead filter and follows the helix arrangement of the liquid crystal molecules. The light is twisted 90 degrees, thus allowing it to pass through the lower filter. When voltage is applied, however, the liquid crystal molecules straighten out of their helix pattern. Light is blocked by lower filter and the screen a ppears black because of there being no twisting effect. The multiplex rate is equal to the number of rows that can be displayed simultaneously. For example, a display with a multiplex rate of 16 can display 16 rows of information simultaneously. HTN (High Twisted Nematic) displays are based on a higher molecular twist (usually 110') than TN (90') and therefore offer wider viewing angles and improved contrast. In fact, these HTN products offer viewing characteristics close to those of STN technology. As low operating voltage as 2.5V and marginal extra cost over TN means that the products are well suited to hand-held applications. STN (Super Twisted Nematic) is a high information content LCD that uses adjustable interference of two optical modes to achieve a large number of multiplexed lines, higher contrast and higher level of gray scale. It results in the birefringence mode. An improved twisted nematic fluid (200' twist or greater) which has better contrast and optimum viewing range than standard twisted nematic. The graph shows a comparison of a voltage versus transmitted light curve of a typical TN and a supertwist nematic (STN) display. (Generally, a greater twist angle equates to higher multiplexibility.) The V90 and V10 points on the graph indicate the voltages that yield 90 percent and 10 percent light transmission, respectively. The multiplex rate is equal to the number of rows that can be displayed simultaneously. For example, a display with a multiplex rate of 400 can display 400 rows of information simultaneously. FSTN (Film Compensation Super Twisted Nematic) is an LCD with an extra film added to the outside of the cell to compensate the colour shift of blue on green to black on white. The film is made of a polymer with double refraction to remove the interference of colours. It results in retardation compensation. The film (the top layer in the figure) is placed in the display, either under or over the top polarizer. Some film compensation systems use two films, one on the rear that serves as a collimator, and one on the front that serves as a dispersion film to broaden the viewing cone. Film compensation improves the viewing angle, but does not affect switching time. FSTN is all standard STN displays with a polymer film applied to the glass as a compensation layer instead of the second cell as in the case of the DSTN. This simpler and more importantly cost effective method provides the preferred black on white image for this display technology. DSTN (Double Super Twisted Nematic) was the first commercial black and white conversion of the STN display. DSTN displays are actually two distinct STN filled glass cells glued together. The first is a LCD display, the second is a glass cell without electrodes or polarizers filled with LC material for use as a compensator which increases contrast and gives the black on white appearance. Contrast: better than STN, FSTN; offers automatic contrast compensation with temperature. Optical Cast: DSTN reduces the tendency of a screen to be slightly red, green or blue. Temperature Range: -30 to +80 C operating, -40 to +90 C storage. Polarizer Mode: Negative, so DSTN LCD's need backlighting. Back Light: CCFL or LED only. Resolution: up to 122 x 32 dots. Suitable Applications: Automobiles, Gasoline Pumps, etc. Electronically Controlled Birefringence (ECB) or Vertically Aligned Nematic (VAN) is a electro-optical effect that was first described in 1971. Through this effect a number of distinct colours can be displayed in a LCD. 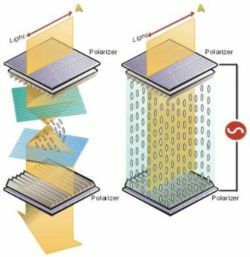 The ECB mode colour displays are realized by controlling both the birefringence of liquid crystals and a pair of optimizing polarizers with retardation films, which are brought from operating voltage rate impressed to liquid crystal layer and inclination of liquid crystal molecules. Thus, the wavelength of light exciting a pixel is determined by the voltage applied to that pixel. Almost every other LCD manufacturer offers this technology today. Low power consumption. Under most lighting conditions, no backlight is required which saves the highest power-consuming element of the display. Simple drive electronics. The single pixel for all four colours requires only one set on common and segment drivers. This also reduces the connector pitch, the cost, and complexity of the assembly. No colour filters. Reflective operation is possible in most environments. colour filters add cost and require a backlight to provide enough illumination to overcome the loss of a given pixel. Low cost. The reduced electronics and lack of filters make the module significantly lower in cost comparatively with passive colour STN modules. Applications: Gaming, etc. Being very sensitive to extreme temperatures and responsively slow, ECB technology is not suitable for the automotive industry or video applications. Multi-colour TN display is based on the negative mode. The colour coatings and the black matrix (mask) are inside the LCD cell. The black mask allows the light go through characters and icons only, not the background. The total number of colours ranges from one to three in addition to the black matrix. Customers can select the colour for each segment. No bleaching of colours is observed even when operating at 80 C, ideal for automotive and other outdoor applications. Displays from static to 1/8 multiplex are available. Black mask is used to mask off non- switching areas in alpha-numeric segment displays. The purpose is to improve contrast and readability. This way, a stronger backlight can be used. Applications: high quality audio and car displays, etc.